A nice portable drum made from a piece of oak trunk, hollowed out partially by Nature and partially by me, with heads of cowhide from Shorty Palmer. The bell is a traditional Malian dunun bell that can be played like this or held up by the thumb and played with a think metal ring on the same hand. Guinean dunun ensembles consist of three dunun: from smallest/highest to largest/lowest: kenkeni, sangban, dununba. 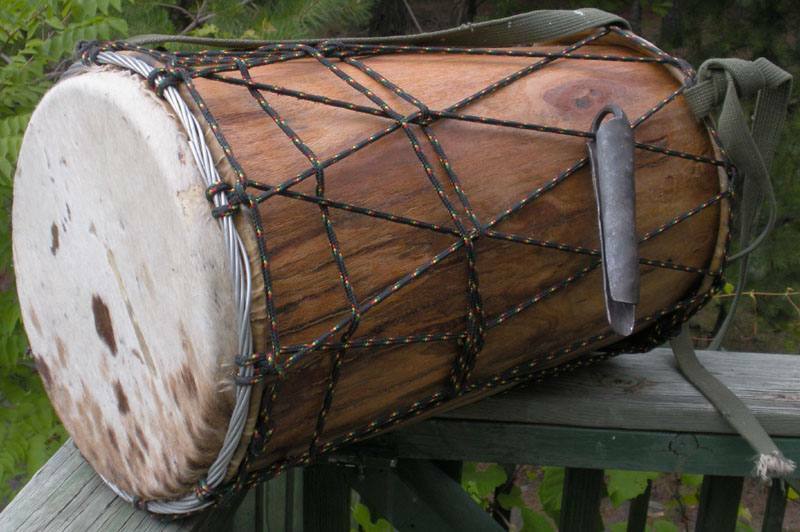 The rhythmic pattern often gets more complex with size: the kenkeni provides the basic signature pulse of the rhythm-family: hence, every Dununba rhythm, sharing the name with the big drum, will have the same Kenkeni pattern, and so on. Playing kenkeni is very hard, partially because it's so repetitive: a better path toward Nirvana, in my opinion, than washing dishes, though the latter is considered necessary and therefore important over much more of the planet: more's the pity. Joy through music should be as important as washing dishes.